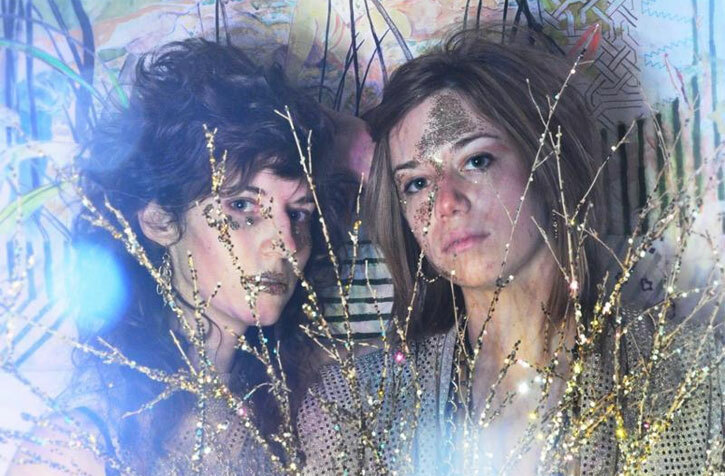 Drawing from a collective mine of times and spaces, Prince Rama (made up of sisters Taraka and Nimai Larson) takes the threads of ancient symbolism and ritual and weaves a surreal universe that is wholly their own. Their often-unpredictable live shows graze the space between psychedelic ceremony, performance art and initiation rite. Trust Now, their 5th full-length album and 2nd album to be released on Paw Tracks was born out of this fantastic ritual space. Spawned from the vernal heat of the Florida swamps amidst swirling patterns of pine orchards and pre-Columbian artifacts, Prince Rama was whispered into the ears of Taraka Larson, Nimai Larson, and Michael Collins in the summer of 2007 by the clanging of prayer bells and goat-skin drums. They left the Hare Krishna farm where they were living to attend art school and form a creative nucleus in Boston. The visceral, devotional and raw “Threshold Dances” and “Zetland” were released as the culminations of those early collaborations. At this time Taraka also began working for the controversial visionary artist Paul Laffoley, and inspired by his architectural diagrams of utopic space, composed Architecture of Utopia.